Knowledge Adventure Books by You™ is a make-your-own-book software experience that inspires the love of reading in children as they create their own books. Award-winning actor and author John Lithgow guides the way as children choose a story line and transform it with their own ideas. Users can publish a real book that children will love to read and the family will treasure for years to come. This product received a spring 2007 Parents' Choice Recommended seal in the software category. New Orleans is one of the world’s great cultural crossroads, and children who grow up there are steeped in the music of the city. Now, kids everywhere can enjoy the mood-lifting music of the Big Easy with "New Orleans Playground." Part of Putumayo’s efforts to offer relief to victims of 2005’s Hurricane Katrina, New Orleans Playground lifts everyone’s spirits as artists from Fats Domino and Hack Bartholomew get their toes tapping. "A portion of the proceeds benefits the Louisiana Children’s Museum," Manager Mona Kayhan of Putumayo Kids told TDmonthly. Beth Blenz-Clucas of Sugar Mountain PR called attention to the native distinctiveness of the CD: “There really isn't another collection of New Orleans songs geared specifically toward children.” This product received a spring 2007 Parents' Choice Gold Award. Launch date: May 22, 2007. 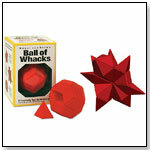 Ball of Whacks by U.S. GAMES SYSTEMS, INC.
A marvel of engineering, the Ball of Whacks is made up of 30 magnetic rhombic pyramids that can be taken apart and rearranged in endless creative ways. More versatile than a puzzle and lots more fun than a brainteaser, there’s no right or wrong way to use it. Just pick it up and play with it! Designed to be a creativity workshop in a box, Ball of Whacks comes with a 96-page illustrated guidebook providing exercises for creative brainstorming, strategies for problem solving, insights into the creative process challenges to construct shapes and mosaics, and to invent new ones. The game is also a good stress reliever for active individuals working under pressure. Word Sweep by INTELLINITIATIVE INC. These 26 individually designed plush alphabet letters have been created with baby's senses in mind. Rich fabric textures enhance tactile stimulation and individually appliqued facial expressions foster creative play. The package comes complete with 26 brightly colored straps for added versatility, an original board book entitled Shopping With My ABCs, and a colorful carrying tote. This product is an iParenting Media Award winner. Launch date: October 15, 2006.
put together puzzles. Printable activities in math, reading and science are included. This series won a 2007 Teachers' Choice Award for the Family. And "True Blue Friend" won a Learning Magazine Teachers' Choice Award for 2007. — President Cheryl Block noted that her company has integrated the tangible quality of books with technology. 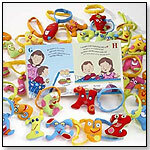 Children begin with the story, use the computer as a tool, and then use printable activity pages for hands-on activity. Around the World: By rolling the dice and circumnavigating the board, kids ride the Channel Tunnel through Paris, walk through the streets of Bangkok, visit temples in Nepal, and dive among sea turtles in Australia as they voyage the board game’s primary categories of People and Places, Culture, World Bank, Geography, Language and World Wonders and attempt to answer questions about those categories. Questions answered correctly earn tokens; the ultimate goal is to fill up one's Global Scorecard. 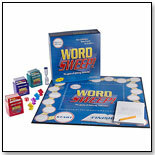 The Ultimate Global Board Game is lauded by teachers, librarians, parents, travelers and students. This product is a 2007 Dr. Toy Best Children's Product Award winner. Schoenhut's new Mini-Grand is the perfect choice for a toddler's first piano. It is just the right size for a child's favorite doll, too. Both fun and educational, it is an ideal instrument to encourage musical creativity. 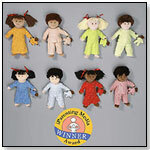 These 14" tall multicultural rag dolls have adorable embroidered faces. The boy wears pajamas and holds a teddy bear with matching PJs and the girl wears a nightgown and holds a matching teddy bear. It is perfect for accompanying child to bed. It is machine washable and dryable. The Nighty Night Doll “is sweetly appealing, soft and cuddly. Nowadays, when so many dolls talk, burp, sing, move and do things that are possible with electronics, it's good to have a back-to-basics doll,” Fanny Wong of Fanny’s Play House told TDmonthly. It was named one of the 100 Best Children’s Products of 2006 by Dr. Toy and received a 2007 iParenting Media Award. Viewing products 1161—1170 out of 1181 products.